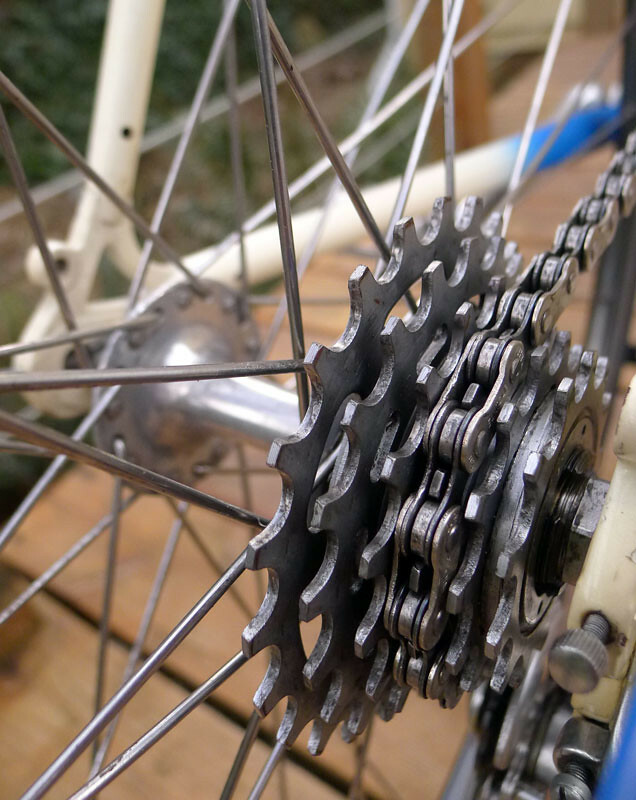 In 1986 steel framed bicycles were in their prime. High quality bikes, at reasonable prices, were being cranked out by manufactures such as Miyata, Schwinn, Univega and of course, Fuji. Who knew at the time, legends were being born? 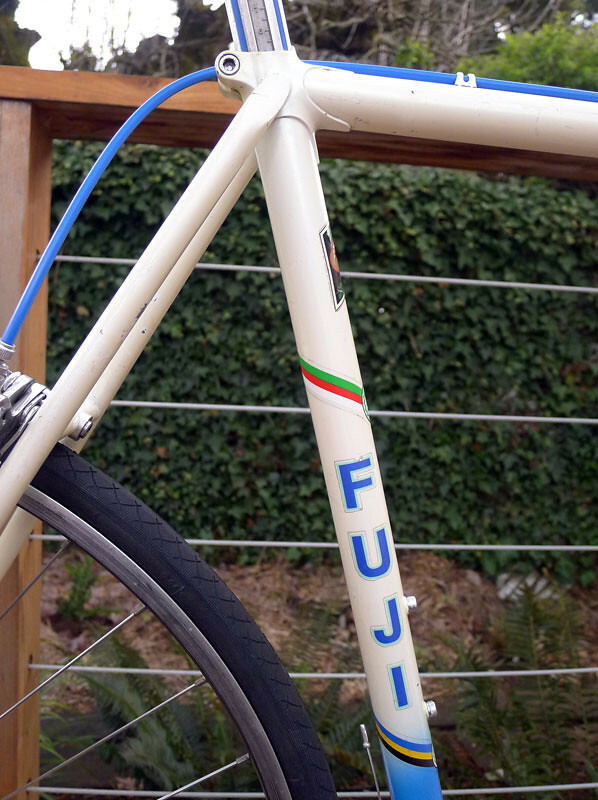 This ’86 “Glacier White” Club Fuji is no exception. Although this frame came to me in fairly rough shape, I feel I have taken her about as far as possible without a full blown repaint (or major match and touch up project). When received, the frame was filthy, cables, brake pads and bar tape in non-usable condition, lights and fenders attached by zip ties (!! ), random stickers applied, mismatched rubber that was long gone along with a general feeling of a bike that simply been rode hard and put away wet. 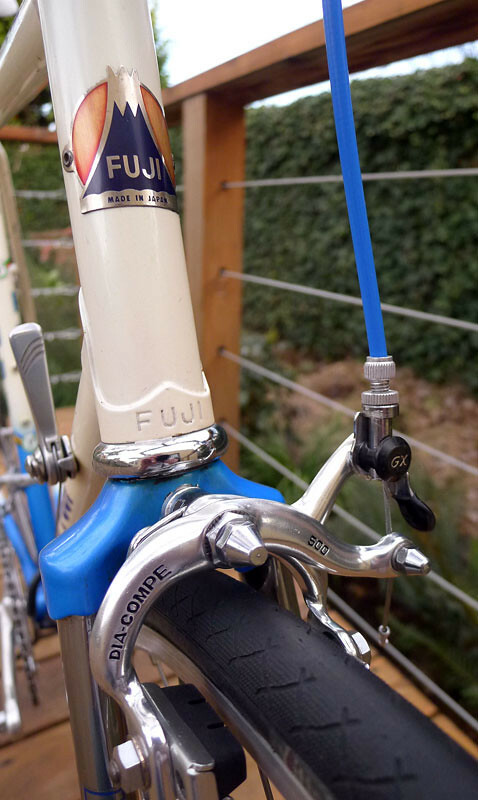 However, these 80’s Fuji’s are, in my opinion, under appreciated and although rough, I could see good bones. 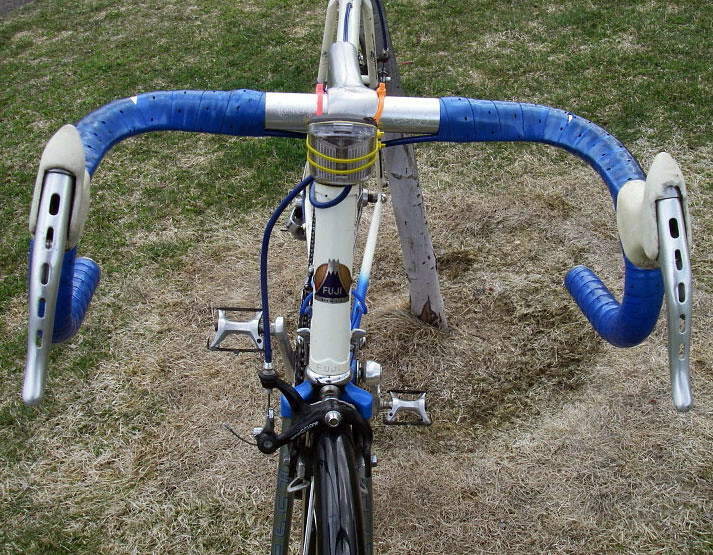 Original Seller Shot: Zip ties and 26 year old bar tape. Renovation included removing anything bolted on for a thorough, deep cleaning starting with the frame. Unfortunately, this bike had innumerable paint chips, especially near the drivetrain chainstay (dimpled paint chipping occurred from a lose, slappy chain) and also on the seatstays. These seemed to be the largest areas. Anywhere I found the paint rubbed off I paid special attention to. Exposed areas were cleaned and rust removed and brought down to bare metal. Since I did not want to take this rebuilt to the level of matching paint, the areas were hand clear coated (2x) then waxed so that no rust accumulates in the future as long as proper maintenance is taken into consideration. Thankfully, I was able to salvage most of the original parts although, sadly, during the cleaning, the rear derailleur lost some of its “Suntour Cyclone” script. During this time, I felt that the black anodized Suntour Cyclone brakes did not fit the overall color scheme so I made the executive decision to change the feel by attaching period appropriate Dia-Compe 500 GX’s. The rest of the bike was overhauled with new grease, oil and bearings throughout (excluding the sealed Suntour hubs which already spun like butter). Other replacements include a new Shimano sealed bottom bracket, Nashbar Vintage Saddle, bar tape, brake hoods and cabling throughout. New rubber was also installed (Vittoria Zaffiro) and of course, the wheels trued. Since on the subject, I feel the need to plug the Nashbar saddle applied. Although inexpensive, I feel these saddles are an excellent value and actually don’t feel too bad on the road. Like pedals, saddles tend to be an extremely touchy (ha ha?) and personal item. I find that a buyer will change both pedals and saddles out after a little time on the road so why put the best of the best on, unless the build is of a higher end. I believe that as long as the aesthetics match and the item is not of low quality these two items have some wiggle room since they will most likely be replaced anyway. Lastly, make sure to take note of the wonderful seat pillar. I love the fluting with matching paint. Quite a nice touch from the factory! The following are the specs from the 1986 Fuji catalog. They don’t differ too much from this Club. Hey the fuji looks great, i really like the color scheme. You cleaned it up really well too! Thanks for the comment, Andrew! This one took quite a bit of time (just under a year!) because of other projects I had going on although I am pleased with the way it turned out. The fade style of paint is my favorite as it is so screaming 80’s. It typically looks really fantastic unless the two colors clash hard, which also happened quite a bit in the 80’s. The only problem is when you have a minor blemish that falls within the fade. Good luck touching those up. Also, as a side note, keep up the great work on Toronto Vintage! I’m a big fan. Wow, thanks for posting your work here. I found this page while searching for 86 Club Fuji info. Like you I’ve taken up the hobby of bringing old bikes back to the road. Unlike you though, I’ve just started, so I still have a long way to go. I’ve decided, to make it simpler for myself, to stick with Mid 80s Fuji bikes. The hardest part for me right now is the touch ups… How do you go about matching colors, and what sort of clearcoat do you use? I have an 86 Sagres which is nearly pristine, but the chainstay is really pockmarked. I got the rust down to clean metal, but not sure what to do with it now. Matching touch up color is an ongoing challenge for me. I’ve found that it’s like the old saying goes, “a minute to learn, a lifetime to master.” The more involved I get, the more I realize how far down the rabbit hole I have gone and how much further I can go. For quick and dirty, I highly suggest nail polish. Your local drugstore, such as Walgreens, has a slew of of colors and they have no problem with you bringing your frame, or even a full bicycle, in to compare the nail polish color to the frame. They are usually frantically watching for shoplifters anyway, so some fella with a bike is the least of their worries. What you will have to worry about with nail polish is the issue of dry back. Meaning, what the color looks like after it is dried on the frame because it will certainly be different than the color in the bottle. My suggestion is to buy a few and test them in areas not easily seen by the public. Under the bottom bracket is a good spot to start. Once you find a suitable color, the bare metal is essentially protected but if you’d like to add more strength to your alteration, cover the newly painted area with a very thin layer of clear nail polish. This will fully coat and protect it. The best news? If you don’t like your results, you can use nail polish remover to erase the job you did! The other option is to find colors at your local hobby shop. Model paint now comes in a variety of different brands (not just Testers) and very specialized brushes to help make the job easier. You’ll spend more but the results will also likely be better. That’s about as much info as I can give for your minute lesson in paint touch up. Although I do have more tips/hints but that should give you enough to get you started and be dangerous. Have fun and thanks for swinging by the site! Thanks for the tips! Really like your site and the work you’ve done! I’m happy to hear you’ve gotten something out of the posts, Tom! Swing back by anytime. I like your Club Fuji. I find and ride 80’s Fuji’s too. I’m into Leagues because they have the good frame and I convert them to fixies or flat bar city bikes so the components don’t matter as much. If I found a Club or Team of Opus i would restore it though. I’m getting a Sagres this week. Have you had any luck finding cones for LaPree hubs? I’ve been babying two sets along near the end of their life and would love to replace them. I’ve tried Wheels Mfg but none were tapered enough to fit. Here’s a way to find touch up paint. Go to an auto body supply store. Frequently, the have spectrophotometers and software to match paint colors. That and the experience of the mixer can get closer than most pre-mixed colors. Fuji has a slew of bicycles I’m constantly looking for. The Team is one, the America is another, the Touring Series III and IV. The list goes on and on. They really did make years of very fine bicycles. I don’t see many LaPree hubs come across my path. However, a contact I know mentioned stumbling across a website that provides a method for refurbishing pitted cones. You chuck the axle and cone into a drill and polish the cone with 650 grit sandpaper wrapped around a dowel that matches the cone’s curve, using successively finer grades of sandpaper, until you get a nicely polished finish. Perhaps a little research on your end may yield injecting some new life back into those LaPree’s? Great suggestion on the paint. I’ll give that a shot next time and see if the price point and level of service can works for the build. I agree with your comments about Fuji bicycles. 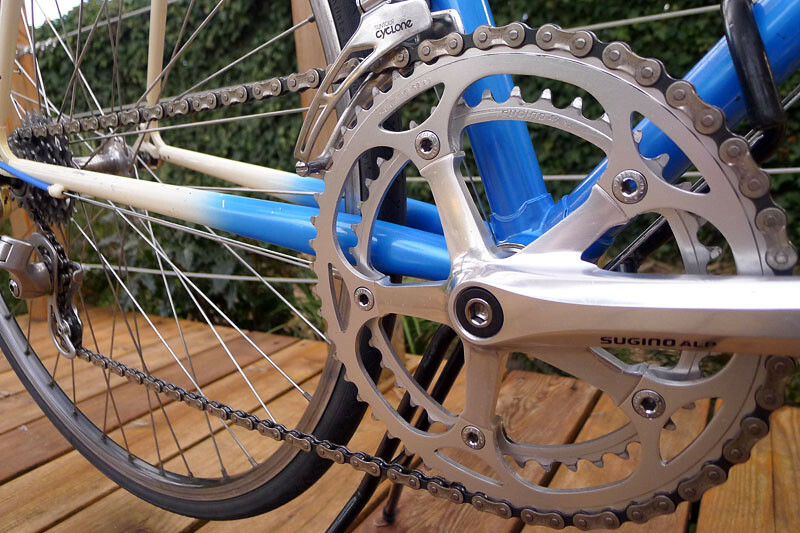 They, along with Centurion and Univega were of incredibly high quality in terms of craftsmanship and materials used. As for the paint, going back through my bottles, I skipped the nail polish and went with either Model Masters GL White or Model Masters Insignia White. I wish I had a more definitive answers for you but the years have faded the details from my memory. Thanks I will defiantly, check those out. Anything to point my head in the right direction is much appreciated! Thanks so much for the post. Kinda riffed on what you had done on my same Fuji Club. Rides like a dream. Used Michelin Lithion tires with blue trim. Any luck getting the brake hoods to not gum up? They get awful sticky. And hard to find to re-place. Nice tire selection! As for the hoods, are you wearing riding gloves? If not, I highly suggest a pair. Even some inexpensive ones would work and they would likely help the stickiness of the hoods. But, make sure to first clean them with a scouring pad, some Isopropyl alcohol and a little diluted Simple Green afterwards. If they are really bad, the other options is finding more hoods on eBay. That’s where I typically get mine when I need NOS or a nice, used set. I had a club fuji in 1985 and by the way the best years for all japanese is typically around 85 and 86. The Club was one of the best all around riding and even racing bicycles I ever rode. I was stronger than average and needed a strong steel for sprinting and it was no slouch for racing with the proper angles and a slightly aggressive set of angles for what it is. Its not a club racer only, you can do full touring with it, or you can race. The frame was the ideal in Steel production bicycles as far as what it offered for its price. It came with Cyclone and great 144bcd crankset. It had superior strength and was very pretty looking. It was nearly identical to Miyatas 710 of the same year and both were very special machines. Today most make a huge mistake in buying a $5k carbon racing bicycle to ride on weekends. They have hair, lycra, carbon and 23c tires, I see them all the time, a corvette when they need a minivan. 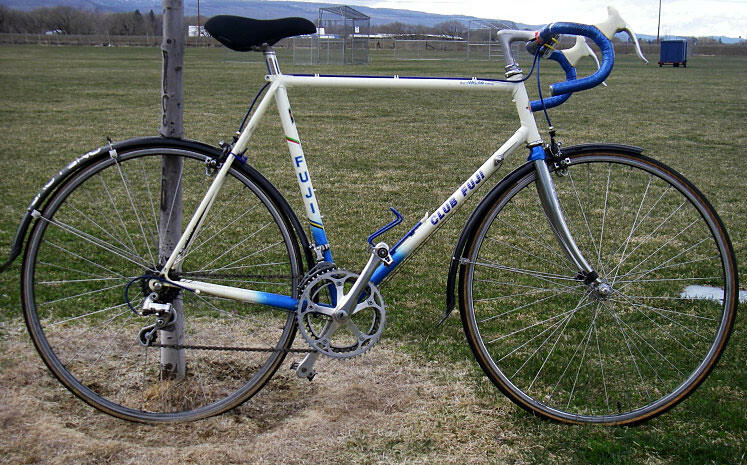 Really Im serious the Club Fuji was the peak of what 90% of bicycle riders need. No carbon, no delicate treatment needed. The angles and the ability of this frame design was perfect for the average rider. A tad more relaxed angles than a full race bicycle but a lot more comfort and equally quick. Remember quick steering does not mean fast on a bicycle. The Club can take 28c tires and for about $400 a person can get a nice example, put some tires on it, and then put some aero brake levers like Tektro. This bicycle was a superb bicycle, and I would much rather have it and $4500 to keep in my pocket and in truth I would put it up against any carbon bicycle today if you heavy or strong, and these bicycles will last 25 more years if in good shape. That’s a very fine review, Issac. There is a lot of truth in your comment. Although, the marketing departments around the world whose clients are bicycle manufacturers, parts and gear all want to tell us the exact opposite. Sadly, it has worked on many. Big Amen to that. I too feel that bikes are over-marketed and the old lugged steel Fuji’s are classy. I love both my1985 Fuji Leagues. Not as high end as the Club but still a sweet bike. One is converted to a fixie, one built up as a 21 speed. Both are still going strong on the original wheelsets. I’m just starting to appreciate the vintage Fuji’s. Last month I bought a nice 1980 Fuji Newest frame and I’m currently building it into a 1980 Professional in Newest clothing. By that I mean, I am going to use mostly 1980’s vintage Suntour Superbe and Superbe Pro components which the Professional model used, but it will be installed on the Newest frame. BTW, the Professional and Newest used the same frames with Suntour Superbe dropouts. The 1980 Newest used the original Cyclone series components, which I also like but hey why not go for the best! 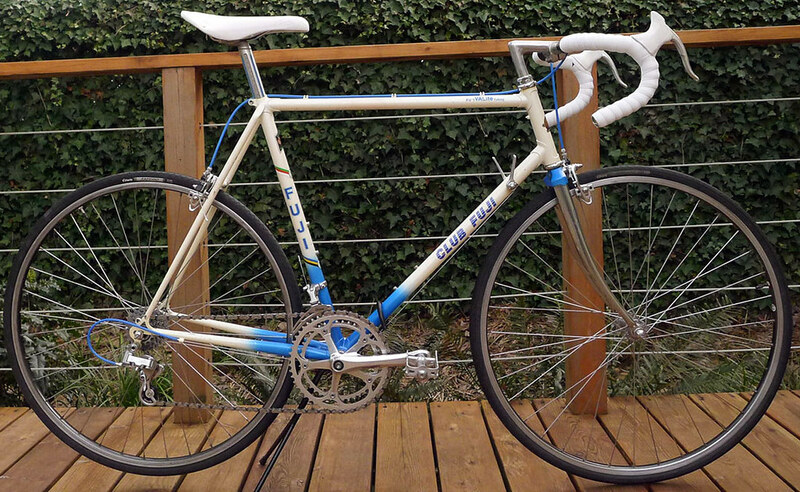 I’ve also just purchased a 1985 Fuji Club that will need a bit of work as the frae appears pretty scratched up. That will be my first go at the VALite tubing vs the 331 Co-Mo tubing on the Newest. I did learn one important thing about the 1980’s Fuji’s or at least this 1980 Newest, and that is they left very little clearance between the top of the tire and the frame. Originally the Newest had 27″ tubular tires. So I figured I’d use some 27″ clinchers in the rebuild. Well with the brakes installed the tire rubs to bottom of the brakes pivot bolt! So I will need to go with 700C rims now if I want to go with clincher tires. A new lesson learned. I know I wouldn’t post something if it wasn’t true so I did some digging. Since the Fuji is long gone, I was able to unearth an image of the type of decal on my Club Fuji. It’s not 100% identical but it’s close. Lucky you to score such fine specimens of Fuji brilliance! Even with the tight clearance, they all sound like keepers to me. Nice work! A couple of ideas on your brake clearance issue. I’m assuming that it’s the rear brake that rubs the tire. If so, here’s a couple of solutions to consider. If it’s the front brake, #5 is NA. Please don’t be insulted if these are painfully obvious to you. If any of these ideas induce nausea, the 700C wheels may be the ticket. 1. Sometimes after the brake is adjusted, the clearance increases to a usable amount. This is more true of dual pivots than singles. 2. All clincher tires are different heights. Vittorias seem to run shorter than Panaracers, for instance. 3. Different calipers, DiaCompe 500’s for instance, have less meat around the pivots and give more clearance. 4. I’ve filed out small amounts of the brake caliper with a half round file or re-drilled the front facing hole on the rear brake bridge with a slightly larger bit to give a tiny bit more wiggle room for the pivot bolt. Elongating the hole with a small round file will do the same. Using a concave washer under the nut will cover the hole and keep the caliper in position once it’s socked down. Some thread locker (on the washer) might help, also. 5. This last one is not for the squeamish. It’s good for <1/8" more clearance. From your local hardware store, get a heavy steel or iron pipe section that fits loosely in the gap between the seat stays under the brake bridge. 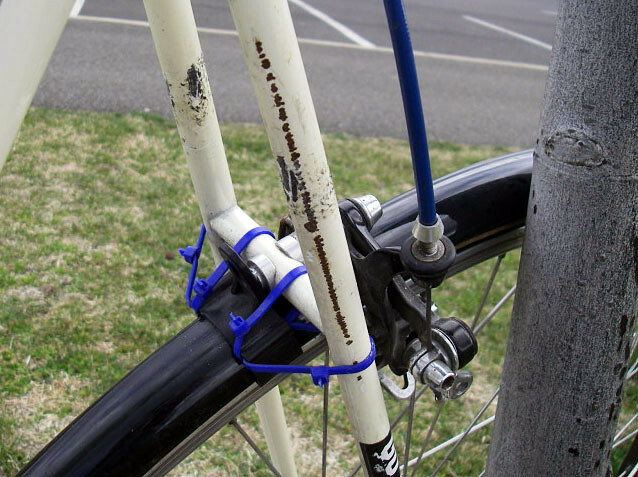 Rest the bike with the top of the seat tube firmly on a solid surface, Put a bolt through the brake mounting hole. This prevents the hole from crushing closed. With the pipe in position, at a 90 degree angle to the seat stays, give it a good whack with a hammer. A 20 or 24 oz hammer is a good choice. The head is small enough to not hit the seat stays but heavy enough to make a difference. Don't whale on it like Thor, just let the hammer and pipe do their metal thing. Repeat as needed. You can judge progress by the curvature forming in the brake bridge, Don't overdo it. The main caution is to make sure the welds on the bridge or where the seat stays attach to the seat tube don't crack. Thanks for chiming in, John. Great suggestions in order of level of skill and comfort. I then tried a 27″ MAVIC rim wheel with a KENDA 27 X 1 1/8 ((28 630) tire on it. I only had a front wheel so could only measure that clearance. It was 4mm in the front now or about double of that with my planned wheel set above. Next I grabbed a 27″ Ariya rim wheel off another bike which had the Panaracer Pasela 27 X 1 1/4 tires on it. You were correct, and I kind of expected it too, there is NO clearance with this setup! It even squeezes down on the tire a wee bit. I love those Panaracers, but they are beefy tires for sure. Right now I could possibly do some 27″ wheel swapping between my other road bikes here and find a set up that provides a decent clearance like the MAVIC/KENDA combination. However, I only have that one front MAVIC and no matching back wheel. As I mentioned I just bought another Fuji. A 1985 Club is on its way from Alabama to my home (Between Chicago and Milwaukee). That bike has a pair of Ukai 700C 25 wheels on it (minus tires). I think I’ll use those on this 1980 Newest build as they will match manufacturer wise to the originals. I’ll keep the Sun Mistral’s for another rebuild in the future. Those 700C’s should provide all the clearance I need no matter what tire I select. I already experimented with my Superbe brakes I’m using and they will work fine with 700C’s. Addressing your brake comparisons. Again you hit the nail on the head. I tried some DIACOMPE 400’s I have here and they do not add any clearance spacing reduction to the setup. However, the Suntour Superbe 1st Generation brakes do reduce the clearance by 1mm or maybe even a little more. You can tell the Superbe’s are “built” compared to the 400’s. The 1980 Professional and Newest used GRAN-COMPE 400’s. I always thought the GRAN-COMPE was pretty much the same as the Suntour Superbe labeled brakes. Maybe they aren’t as beefy though. Funny Fuji used the Superbe brakes on their 1977 Professional and Newest, but from 1978 through 1980 they went to the GRAN-COMPE. Before 1977 they also used GRAN-COMPE, but I think that was due to the fact that the Superbe Line didn’t exist yet from Suntour. 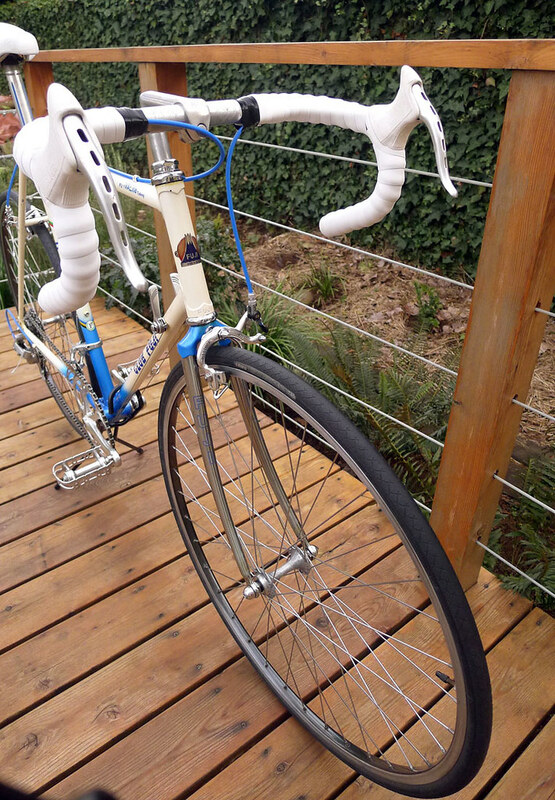 I’m on a mission to make this 1980 Newest into as much a Suntour Superbe component bike as I can. Fuji seems to be one of the few companies that used Suntour to a large extent in the 70’s and early 80’s. Others always seem to keep a mixture of Suntour and Shimano. Thanks again John (and Josh too) for your replies and suggestions. I usually try and put off drilling and bending unless absolutely necessary. I have straighten a frame already on my 1980 SR 10-speed and I will be drilling out the front fork on this Newest to accept a recessed mount for the front brake (I did the same to my aforementioned SR too). 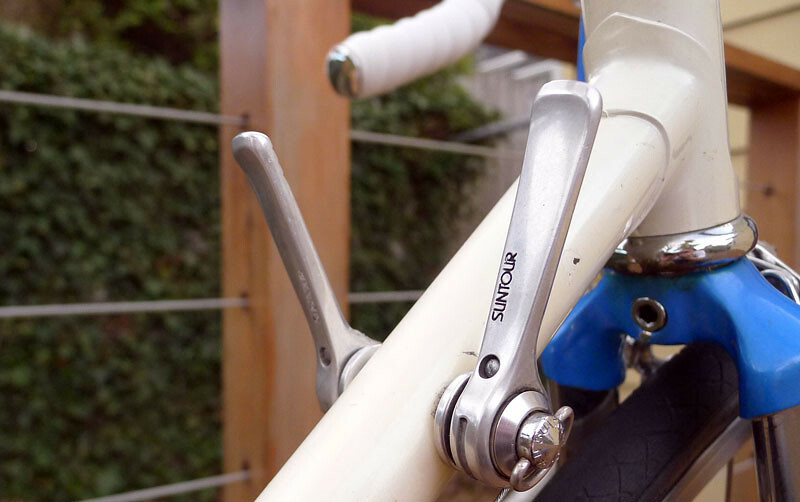 The rear brake will be conventional pivot bolt with nut. One additional item I just thought of. I’ve notice looking through many of the vintage Japanese road bike catalogs (Mid 70’s thru mid 80’s) that usually the top end bikes used 27″ tubulars and then once you get a few models down they seem to start using 700C’s. I wonder if some of these issues that I’m encountering might have been the reason behind that. Or perhaps tubulars didn’t make the move to 700C size until after the clinchers. Inquiring minds want to know! I have a 1986 Fuji Allegro 12 speed. Valite triple butted. I recommend Kenda K36 27×1 1/8 skin walls for rubber. I thought about modern tires after running Forte GT2 Kevlar trainers from 2007-6/2016, the vintage skin walls are light and the really the best tire for this bike, even though they are pretty ugly. The Kenda’s are 310 grams. Originally the bike had SCCR 2000 tires. Over 30 years ago, I had a brand new Fuji Gran Tourer. Loved that bike and road many miles on it but for some unrecalled reason, sold it. As with most things, as you get older, nostalgia kicks in and you want to replace those fond memories. I recently found the same bike in 99% original condition in the same green color but a larger 58cm frame. It will be primarily a wall hanger with a few good weather rides. I also have another Gran Tourer as well as a S12-S in good original condition. Fujis are good quality and good riding bikes, a bit on the heavy side but I still like them. 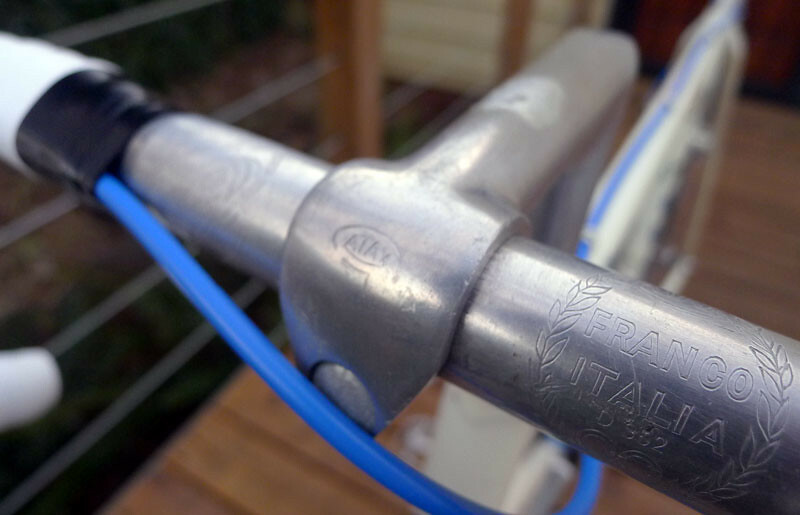 This entry was posted on March 19, 2012 by Josh C. in Cycling Projects, Topics and tagged Club Fuji, Quad-butted chromoly "VALite" tubing.